Lego games are boring imo. If you played one you played them all. i played the harry potter lego game for a while..Collected a zillion coins/beans/whatever, but couldnt figure out what to do next...That was my first and last lego game.. I agree , My little boy loves lego Batman. well lego games beat having to talk to the half brained idiots i work with. 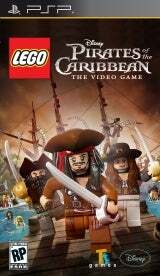 I would say that the Lego Batman , especially on one of the bigger systems, in my case the 360 was a great suprise for me.. My little boy and I ate, slept Lego Batman for a week.. Bought the other lego games and thought they were sort of a let down.. AAtleast until I played Lego Pirates of the carribean.. First on the demo from xbox live.. Getting everything you possibly can on that demo between me and my little boy in free play.. And now again with the psp full version that I made about a week ago running on 6.35 OFW.. The game on the psp is scaled better than the LEgo batman 's psp in my opinion.. Beautiful game actually.. looking forward to playing it in two player hopefully tom. if the ups bring our second psp.. I bought used on ebay for $25.. My first is a 1000 and doesn't do tv out.. This one is a 2000 and will.. Just said wouldn't read umd's.. Like I care.. : 0) Looking at having some fun with alot of games pretty soon between the two..